Roses are the perfect way to let someone know you're thinking of them and that you care. Whether it's to say I LOVE YOU, Happy Birthday, Congratulations or Just Because! Roses are a simple yet beautiful way to brighten someone's day! Fiesta Roses are like nothing you have ever seen. They offer some of the most unique and beautiful roses I've ever seen. Purple, blue and rainbow roses that are bright and vibrant! Purple is my favorite color and I was blown away at just how colorful the Fiesta Roses were. They almost didn't look real. In fact, my mom asked me if they were real or fake when they came for a visit! Beautifully wrapped and packaged with care to assure their safety. Each rose had an individual water tube to ensure their safe arrival. 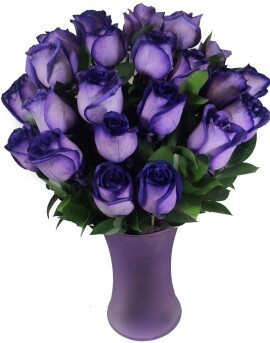 My purple roses also included a beautiful smoky purple vase. I'm honestly not sure who enjoyed them more! I can assure you that they brightened our day, each and every single day we had them. There is just something about a beautiful bouquet of roses that puts a smile on your face. My beautiful purple Fiesta Roses lasted nearly two weeks. The day they wilted was the day I decided to bake a ham. I was heartbroken when I noticed that while I was gone my roses had finally seen their last day. 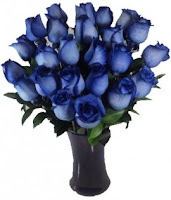 Once you place your order with Fiesta Roses, they are shipped quickly. In fact, orders placed by 3:00 PM EST can be delivered the following day . They also GUARANTEE on time delivery and 100% customer satisfaction! 1. Fresh long stems roses are hand picked from our farms to make our rainbow roses. 2. A trained horticulturist prepares the roses for "fiesta-ization". 3. The roses are placed in a unique substance, which is a combination of water and various dyes. The roses slowly absorb the dyed water the same way as they would naturally absorb water. Our unique process allows the horticulturist to pinpoint which petals receive each color of dye. This results in the various colors being diffused throughout upwards of 60 of the rose petals thus resulting in rainbow roses, blue roses, purple roses. My daughter begged me to let her "do like they do on TV with roses." I wasn't sure what she meant by that but she was more than happy to show me. I can promise that no matter who gets a bouquet of Fiesta Roses will be shocked, amazed and delighted! In addition to Fiesta Roses you can also purchase The Ultimate Roses that are both stunning and gorgeous. They are 3' - 6' tall! You can see my review for The Ultimate Rose. You can also find great luxury and organic gift baskets. ONE lucky Being Frugal and Making it Work reader is going to receive Two Dozen Fiesta Roses!! Winner gets to Choose Between Rainbow, Purple or Blue! You MUST follow Fiesta Roses and/or The Ultimate Rose on Facebook and leave your username in comment. If you follow just one, please leave 1 comment, as that will count as one entry. If you follow both, please leave 3 comments as that will count as three entries!If you are already a follower - leave a comment and let me know. A special thanks to Fiesta Roses for this great review and giveaway opportunity! I follow both fiesta roses and ultimate rose on facebook and left the message from your site. and posted on both that I entered to win! I follow TUR on Twitter! I will post a list during the week! WOW! 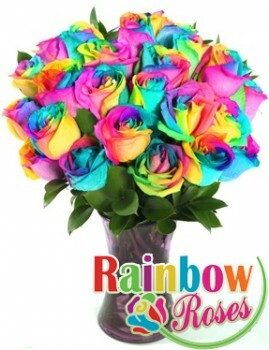 The rainbow roses are gorgeous! Comment 3 for following both The Ultimate Rose and Fiesta Roses on facebook.